This clean, crisp, all white laminate reception desk with silver frame frosted glass panel is an excellent choice for the modern office. White furniture makes a bold, contemporary statement and easily blends with any other colors you may be trying to coordinate. 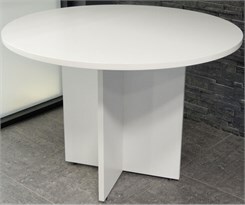 The commercial quality construction of our white laminate reception desk begins with a quality scratch resistant laminate that resists rough wear and wipes clean with just a damp cloth. All tops are 1" thick with a tough 3 millimeter edge band. All hardware is also top notch. 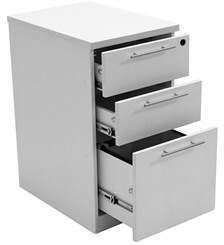 You will definitely appreciate the use of heavy adjustable hinges and ball-bearing full extension drawer slides. 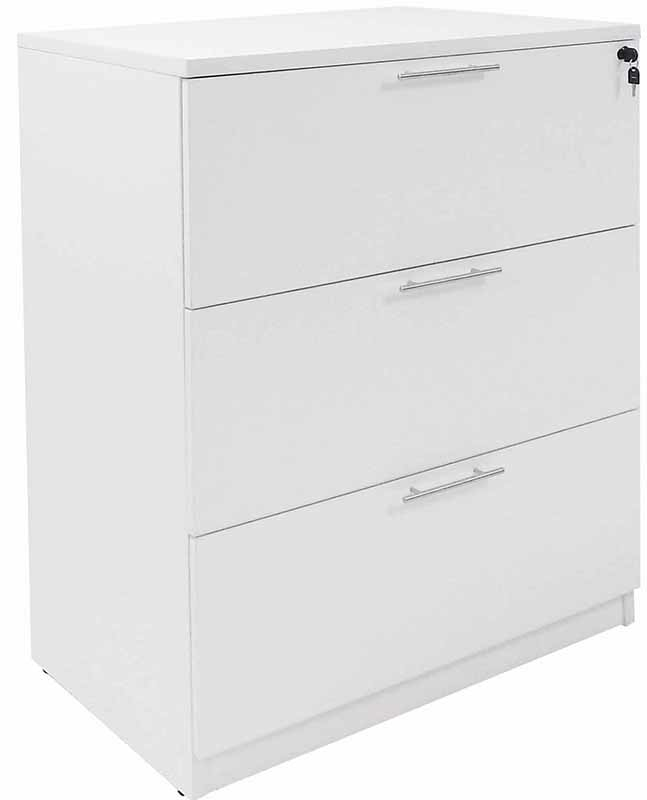 All drawers include convenient key locks. 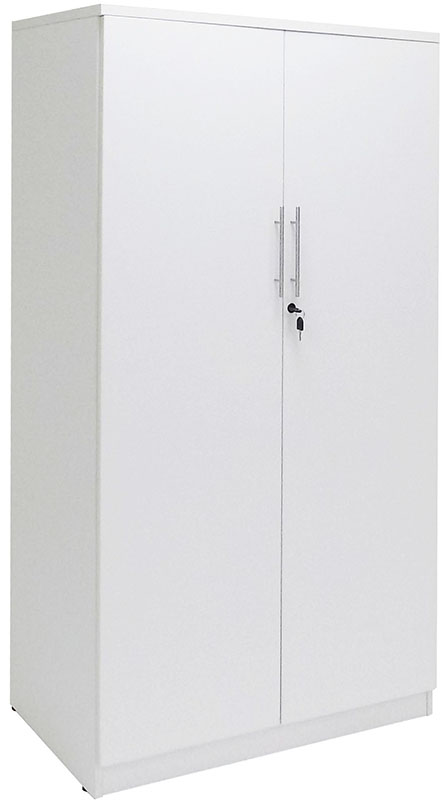 * Clean, modern, white laminate finish resists scratches and scrapes from rough commercial use. * Metallic silver cable grommets. * Silver metal frame surrounds frosted glass panel. * Contemporary brushed nickel drawer pulls. 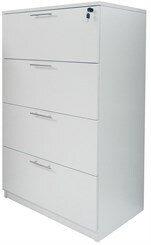 * Top quality ball bearing full extension drawer slides on all drawers. 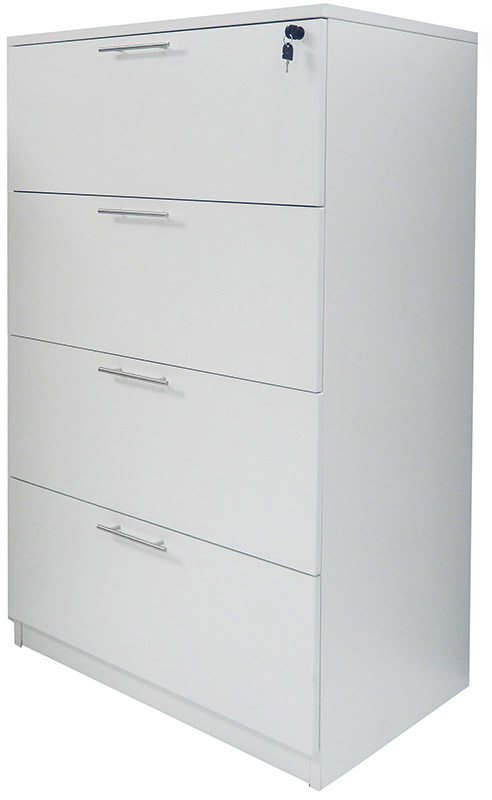 * Drawer pedestals ship assembled. Other components ship unassembled for safety in transit. 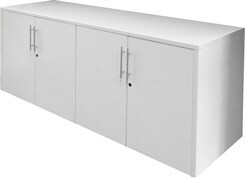 Measures 71"W x 29-1/2"D (36" including bow front overhang) x 42"H overall. 29"H desk surface. 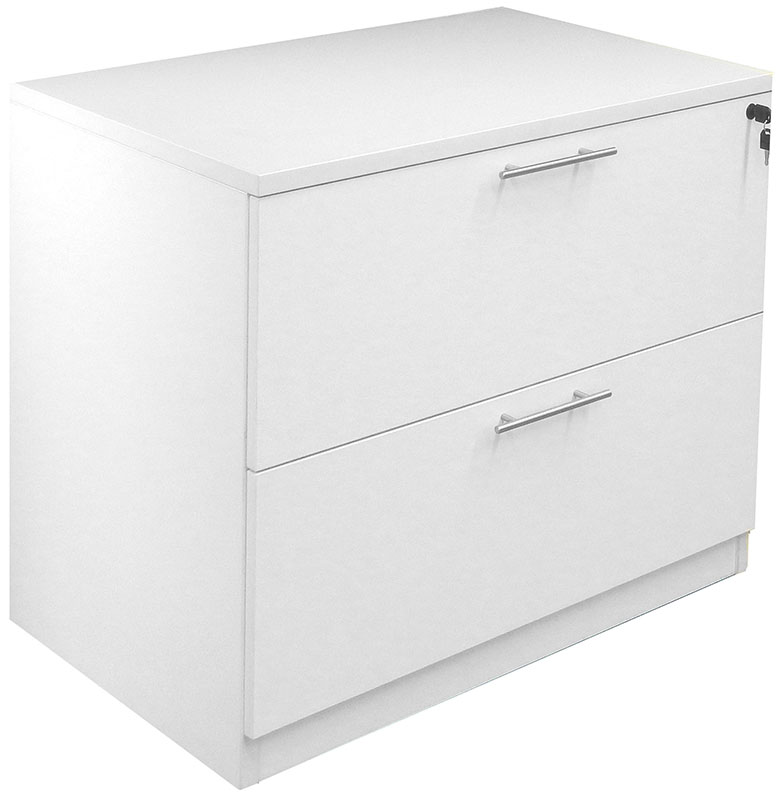 Includes two letter/legal hanging file drawers and four box drawers (all locking). Ships unassembled (drawers assembled). Shipping weight 348 lbs. PRICE INCLUDES SHIPPING! (Truck shipment - see Terms & Conditions). IN STOCK! Our White U-Shaped Reception Desk with Frosted Glass Panel and Hutch definitely appeals to those looking for a bright, modern and updated appearance to greet their guests. Provides an impressive welcome to your clients and sets an excellent first impression. 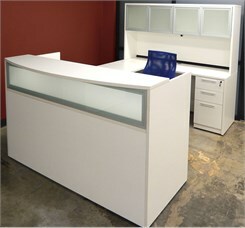 Expansive work area plus abundant storage space for the working receptionist. The light, contemporary feel of this series blends well with many existing office decors and is a popular choice for many offices. Durable laminate easily handles the abuse of the busy office and cleans up with a damp cloth to look new in minutes. Brushed nickel drawer pulls and silver cable grommets are a smart touch. Fully reversible for left or right hand use. 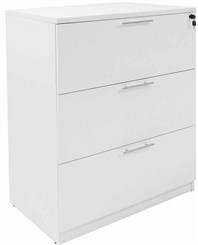 Includes Reception Desk with Frosted Glass Panel and 3/Drawers (71"W x 29-1/2"D/36"D including counter overhang x 42"H), Bridge (47-1/2"W x 23-1/2"D x 30"H), Credenza w/3 Drawers(71"W x 23-3/4"D x 30"H), and Glass Door Hutch (71"W x 15"D x 36-1/2"H). Requires 71"W x 100-3/4"D of floor space. Ships unassembled (drawers assembled). Shipping weight 712 lbs. PRICE INCLUDES SHIPPING! (Truck shipment - see Terms & Conditions). IN STOCK! Does not fit under desk - intended as free standing file cabinet. Rolls on four concealed carpet casters. Top quality ball bearing full extension slides on all drawers. File drawer accepts either letter or legal size hanging file folders. All drawers lock. Ships fully assembled. 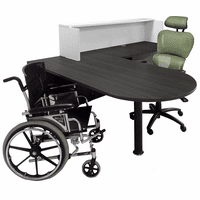 Just attach handles and adjustable floor glides. Measures 16"W x 22"D x 29-1/2"H overall. Shipping weight 82 lbs. PRICE INCLUDES SHIPPING! IN STOCK! 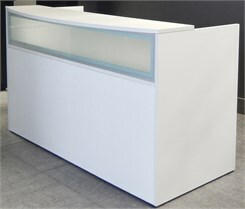 Glass Front Reception Desk in 7 Colors!